Overlooking the Cheakamus River Valley just southwest of Whistler, BC and directly opposite The Black Tusk lies Brandywine Mountain. It is one of the primary summits along the west side of the Callaghan Valley; an area I visited my very first time flying and riding with Whistler Heli. The upper 4WD trailhead provides quick and dirty access to the alpine basin and meadows just below the peak. Based on the discarded beer cans and random snowmobile parts littered about the snow in said basin, it appears to be a popular venue for the sledding crowd. With numerous couloirs descending from a small glacier high on the peak and wide-open slopes below, the sled-assisted ski touring possibilities would seem to be palatable for those suitably equipped. From the meadows, it is a relatively short and easy slog and/or scramble to Brandywine's summit, whereupon the views are grand and dominated by a pair of nearby volcanic peaks - Mount Fee and Mount Cayley. Along with The Black Tusk, I believe these two are the next in a series of South Coast volcanos after Mount Garibaldi - all of which are part of the long chain of Pacific Northwest volcanos that extend as far south as Lassen Peak in Northern California. Something to contemplate while enjoying the long glissade back down the mountain! Not to be confused with the Tricouni Peak in the North Cascades, this Tricouni is found in the South Coast Mountains near the town of Squamish, BC. Located amid an island of peaks sandwiched between the Squamish and Cheakamus rivers, Tricouni is an aesthetic mountain with equally as enjoyable scrambling route. As far as difficulties go, the only drawback is the notoriously muddy trail encountered early on the approach. The crux, assuming one can call it that, is a small headwall separating the upper snowfield and summit ridge from the slopes below. Going right to gain a minor rib and following it to the base of the snowfield seemed a good way to overcome this obstacle. The final romp to the summit follows steepish rock on a broad ridge, whereupon one is greeted by a glorious expanse of rock and ice, and on this day also a thick blanket of low valley clouds. All in all, a day trip to Tricouni is a very worthwhile outing and a must-do for anyone keen on exploring the mountains in this neck of the woods. 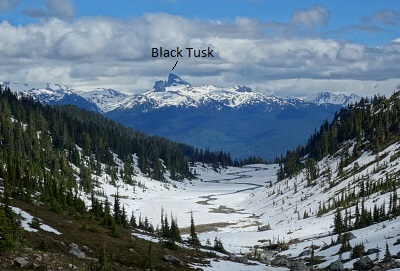 Like Mount Thielsen in the Oregon Cascades, The Black Tusk is an ancient volcanic plug with a similar affinity for lightning strikes. It's all that remains of a once much larger volcano thanks to the ravages of time, erosion and apparently also sudden electrostatic discharges. Situated in Garibaldi Park - arguably Southwest BC's finest provincial park - the 'tusk is one of the most recognizable peaks along the Sea-to-Sky Corridor. Even though most parties never actually set foot on the true summit, a mere stone's throw away and only 10 feet higher, it is a deservedly popular scrambling objective and likely also the most climbed peak in the 'corridor. Reaching the top held extra significance for us, considering that Agata and I reluctantly abandoned our 2016 attempt just shy of the scramble portion of the route. No painful limping this time, just good fun and some very impressive scenery to boot!